Well folks, it's here – Samsung has announced not only a Galaxy S6 flagship, but the widely rumored Galaxy S6 edge – the handset that has both sides of its display warped towards the bezel. 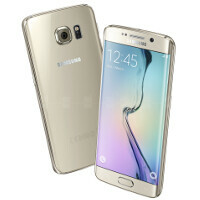 In terms of design, the S6 edge is just gorgeous, its body sporting premium materials and high-class looks , while its hardware is equally impressive – a 64-bit octa-core processor, which gave us some impressive benchmark results, combined with 3 GB of LPDDR4 RAM, and Samsung's new, super-fast flash storage technology all promise an incredibly snappy handset. Sammy has also decided to address the many complaints about TouchWiz being an overcluttered, feature-packed, stuttering mess, and has cleaned up the interface nicely, flattening it up and removing many of its unneeded / rarely used features. So, the Galaxy S6 edge appears to be a great flagship, indeed, but does it lack features, which could've made it even better? Well, let's nitpick! The Edge screen was first introduced with the Samsung Galaxy Note Edge back in September, 2014. The phablet had its display curved only to the right where it housed various Edge panel apps – something akin to widgets, which only live on the side of the screen. Now, the Galaxy S6 edge does have some functionality to its side panels, such as Night Clock, or the ability to view notifications without lighting up the whole screen, or using it to call up favorite contacts, however, in general, the edges have been toned down in terms of function, at least as far the display units are concerned. If it turns out to be the same in the final product, it would mean no more Favorite Apps panel, no S Planner or Data meter on the side of the screen, so on and so forth – things that we would miss, when comparing the S6 edge to the Note Edge. We are a bit skeptical about the 2,600 mAh juicer in the Galaxy S6 edge – it needs to push a QHD display and some pretty potent hardware. The Galaxy S5 housed a 2,800 mAh battery, which fared well with a 1080 screen, while the Galaxy Note 4 had a 3,220 mAh power box to keep its QHD panel lit. So, downgrading to 2,600 mAh is a bit of an odd choice from Samsung, and we do hope that the new 14 nm CPU will be energy-efficient enough for us to not notice a significant drop in battery life. In any case – a slightly bigger juicer would've been nice to see. Many Samsung fans will be disappointed to know that the batteries of the S6 and S6 edge are not user-accessible, which means no more carrying a spare battery to quickly swap when your phone dies. If we are to be honest, we do believe that the mobile world is entering the age of portable power banks, so we wouldn't call this too much a fault, but we can see how powerusers may end up disappointed by this. We did hear a rumor about the Galaxy S6 sporting stereo speakers a while back. Unfortunately, it didn't turn out to be true. While having a single speaker is not exactly a fault, as it's still a pretty mainstream feature on most smartphones, we have to say – if the Galaxy S6 edge packed stereo speakers, its coolness level would've risen up to 11! Another change that comes with Samsung's new flagship ideology – gone are the microSD card memory expansion slots. Sorry, guys, you'll have a choice to buy an S6 edge with either 32 GB, 64 GB, or 128 GB of internal memory, and that'll be it – once you get it, you can't expand it. Now, it could be argued that Samsung went this way because it employs this brand-new, super fast flash technology, and combining it with a much slower microSD could create problems both in proper functionality, as well as consistent user experience. Still, lack of expandable storage may feel constricting to those who are used to have it, and it would've been nice to have the option on the Galaxy S6 edge. Actually no. HTC have never had a "best camera" on any of their models! Their UltraPixel gimmick turned out to be mediocre at best, and their M9's new camer, while it's 20MP, testing (on a non-commercial unit though) have shown it's still crappy and doesn't live up to the challenge. I also see you didn't include the name of Nokia/Microsoft there which is odd! Considering that they are always the ones that bring up new tech in imaging and having the best in class cameras, always! @AlikMalix you say anything new is always the best, so you telling me this phone have better pictures then the Lumia 1020??? I do not even think its 1520/930 Denim level yet. The 1520 capture image perfectly like how it exactly look, its not like other cameras who try to make a picture more brighter than it actually look with your eyes. If you want to make it brighter later, Lumia have editing software called Lumia Creative Studio, which lets you do anything to the picture, so no, this phone will not have a better photos then the 1520/930, but it will be really good, very close maybe, which is still very good no matter how you look at it for a Galaxy 6.
note 4 are on par with 1020 or even the 930 on some aspect, just read some comparison. cool is not pointless, yeah just that. What? If edge panels are not working then there is no difference in S6 and S6 Edge. Just a bent screen from both sides for a higher price, what's the purpose then? There are some few gimmicky feaures, but all in all, it's just for showoff purposes. I prefer the S6 over the S6 Edge, I don't wanna pay more just for showing off. my man....you are right. Idc about edges because i wont EVER use them. Theyre trying the, "apple", approach. They are trying to making it socially acceptible to have a s6 edge. Lord knows some people bought an iPhone not because of the features that you can use, because everyone else has one. All i know is that as soon as T-Mobile puts the pre-order up for the s6, im buying it!!!!!!!!!! @Maherk and @AlikMalix he ask a question on what is the purpose, not if I am purchasing it or not, and I repeat there is no purpose all it do is give them (Samsung) more profit. There is nothing wrong with my response. If you like the product then get it, I have nothing against people who buy what THEY WANT because I do the same, its my phone, its my purchase, so I get what pleases me. Does Nexus 6 have memory card slot? No. And nobody cared. LOL. Exactly! Even when Sony, HTC, and Lg have ditched micro sd slots, there was always a reasonable reason for it according to their fans. Now that Samsung has done it, they found one aspect of the phone to criticize it, as if they were going to end up buying it! To make a premium device, there's no need to make so much sacrifices aside from the removable battery. As I said before, Samsung is clearly not capable of making a premium flagship. You're upset because your get-what-you-pay-for cheap Chinese phones can't hold a candle to real form and function. Likewise with those market failure Sony phones. There's a reason Sony has a hard time selling those things.